For everyone who is on the look-out for a programme on medical education that fits them like a glove, the School of Health Professions Education (SHE) offers the perfect solution: programmes of one or more days made to their special wishes. Participants can express preferences with regard to the staff they would like to meet, topics on which they want to focus, and settings they would like to visit (e.g. the University Teaching Hospital, Maastricht University Medical Centre MUMC+). The programme can be organised at Maastricht, with a delegation of the institute/organisation visiting Maastricht Faculty of Health, Medicine and Life Sciences to attend the programme. Alternatively, the institute/organisation can invite one or more of the SHE 'problem-based learning (PBL) ambassadors' (staff members of Maastricht Faculty of Health, Medicine and Life Sciences) to deliver a Tailor-Made Programme in health professions education at their institute/organisation. Through innovative training and consulting in the areas of education, management and research, in our project around the globe, we promote improvement in health professions education practices. We work with partners from a variety of disciplines, educational backgrounds and cultures. The programme will be tailored to your specific wishes. Maybe you would like to visit the Faculty's library and study facilities, or the University teaching Hospital? Or would you prefer to meet with specific staff members? Are there any topics that have your special interest? To get a better idea of what we could offer you, please have a look at three customised competence development programmes that SHE offers: the Summer Course, Certificate Courses online and the Advanced MSc+ Courses. Maybe this can help you in specifying your wish list. As soon as we have a good idea of your wishes and needs, we will arrange a programme for you, which includes selecting the best staff member for the job. 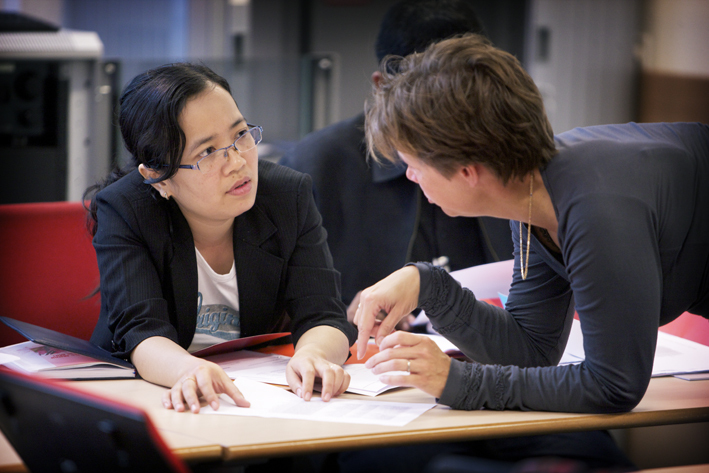 To provide a programme in medical education tailored to the participants' specific interests regarding the Maastricht approach to medical education. The programme can be held in Maastricht or at the participants' home base. SHE Collaborates is available by email or in person. We are always happy to introduce ourselves and get to know our potential partners. After the first contact has been established, we perform a comprehensive needs assessment that can take place by email, phone, Skype, face-to-face meetings, or a combination of these.